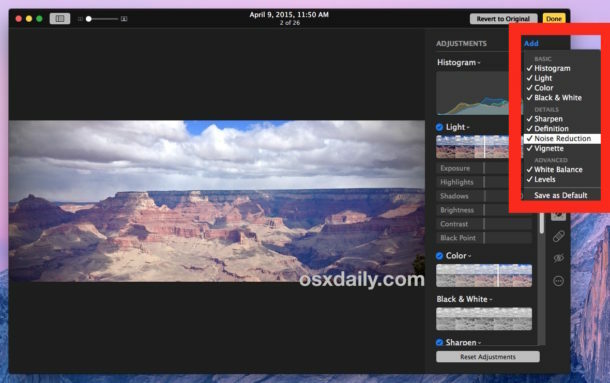 The Mac Photos app serves as a photo manager and image editor, and while the default toolset for picture adjustments is sufficient for many users, you can enable six additional photos adjustments to gain even more control over your pictures. We’ll show you how to enable image adjustment tools for Sharpen, Definition, Noise Reduction, Vignette, White Balance, and Levels, each of which is generally considered a more advanced image editing feature, but the Photos app on Mac does a good job of making these adjustments easy to use and understand. 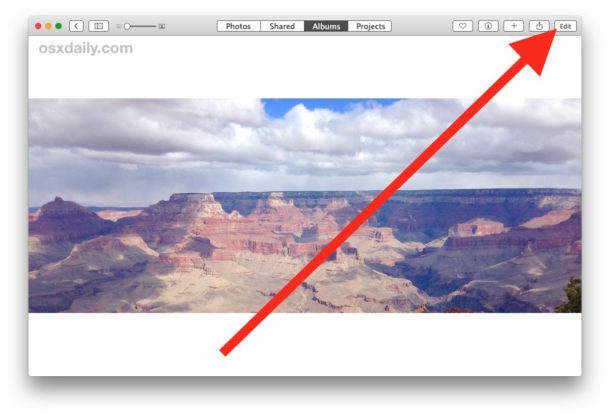 You’ll obviously need some pictures in the Photos app for Mac to get use of the image adjustment abilities. 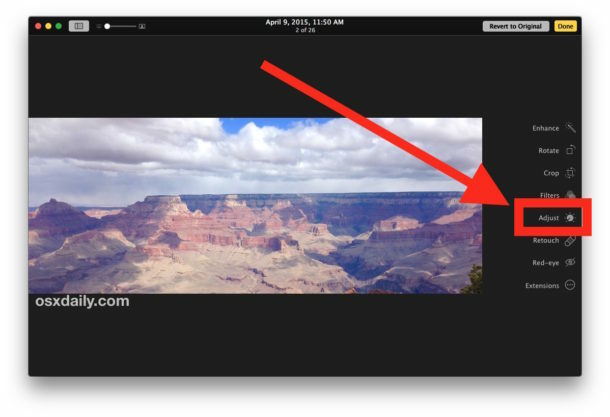 You can import pictures from files, use iCloud, or copy them into Photos directly from iPhone or a camera. 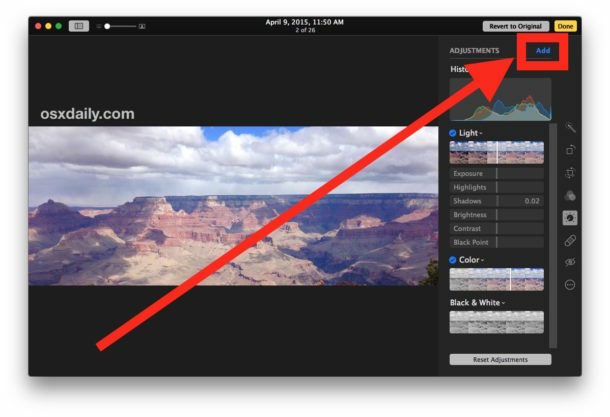 Exactly what each image adjustment option does is better seen than described, so it’s a good idea to check each option out yourself on a sample image to get a better idea of what type of image adjustment they make. As mentioned before, you really should try each adjustment out yourself and individually to get an idea of what they do and the dramatic effects they can have on a picture. 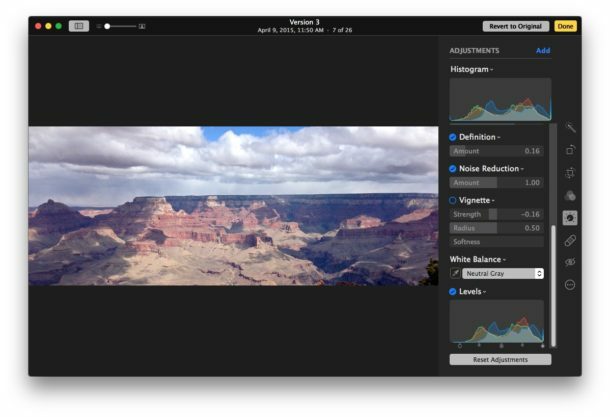 While they are all useful tools, you can certainly overdo using them and end up with an ugly over processed image, proving that with image editing adjustments there is such a thing as “too much of a good thing”. 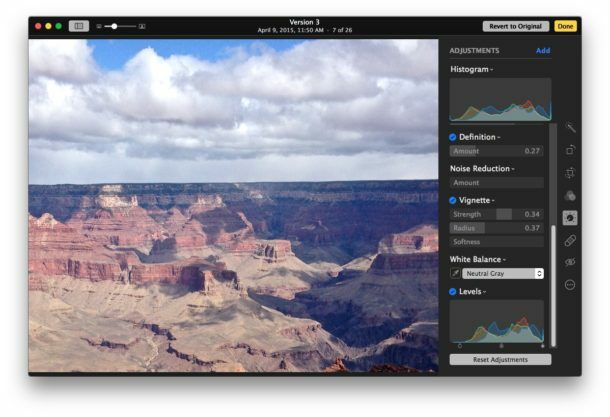 Use the tools sparingly and how they are intended, and you’ll be able to make some really nice quality adjustments to pictures. Nice one Paul. Just the kind of tip a new boy to iMac needs. Hey folks, what great tipps you continuously provide which often can’t be figured out somewhere else or just by using the product! Thanx! Thanks for the tip. 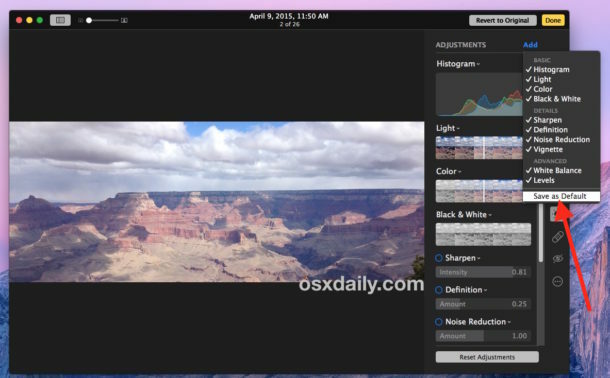 It’d be nice to have these features handy, but when I pick edit, all the options are dimmed out except for extensions. Therefore, I can’t choose adjust.